Until I did a review and giveaway with The Protein Bakery some months ago, I was unaware of them. However, this company is far from turning out just fabulous tasting sweets. Instead, they bake exceptional baked treats that are more health conscious with no wheat flour or trans fats, low gluten, and lots of whey protein and fiber. But if you want to give a thoughtful gift this holiday season, then think about sending something from this New York bakery for those on your shopping list. I received nine luscious products for this review and giveaway. I got two giant cookies, the Chocolate Chocolate Cherry Cookie, a decadent chocolate lover’s delight with hints of cherry and the Trail Mix Cookie, loaded with fruits and nuts. The Black & White Blondie was my favorite, bursting with white and chocolate chips. The Pumpkin Walnut Blondie had giant pieces of walnut in a pumpkin blondie. The Expresso Brownie was yummy, very rich and intense chocolate. I was pleased also trying some cookie duos. The Pumpkin Walnut Chocolate Chip cookies were delicious and loaded with so many walnuts and chips through this pumpkin pie tasting cookie. The Peanut Butter Chocolate Chip Cookies was a hit here also and so was the Oatmeal Chocolate Chips for the chocoholics in my house. But even more incredible was the Chocolate Chocolate White Chip Cookies with enough of both kinds of chocolates to satisfy the most demanding of my chocoholics. Sending a gift of a box, tin, or whatever assortment would brighten anyone’s holiday. I sincerely love what comes out of The Protein Bakery and highly suggest trying them yourself if you haven’t had the pleasure already. 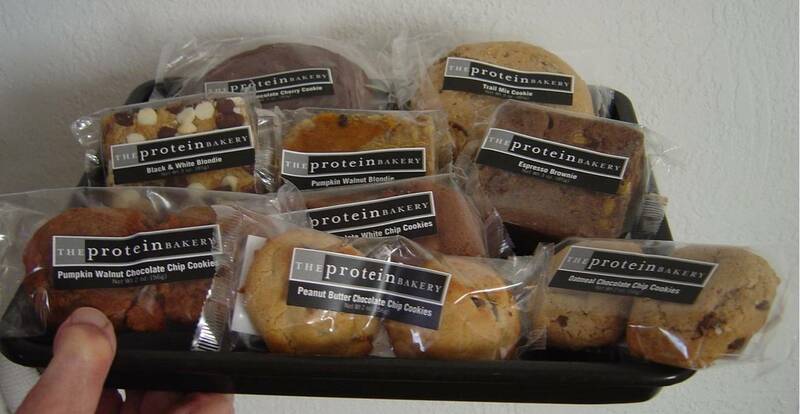 wins a taste of Protein Bakery (an assortment of two brownies/blondies, two colossal cookies and four cookie two-packs) for a $45 value with shipping! 2. Go to The Protein Bakery and tell me what you would love to try first or something you learned from the site in another comment. Leave a separate comment for each entry. Be sure you include your email address inside your comment so I can contact you if you win. This giveaway is only open to residents of the continental United States. No PO Boxes or APO addresses are eligible. Do follow the rules because I check entries. Be alert that if you attempt to enter using multiple identities will be grounds for disqualification. This giveaway ends December 3, 2011 at 12 PM Eastern Standard Time. The winner will need to respond to my email with name and shipping address within 48-hours or another winner will be picked. I'd love to try a blondie! I think the pumpkin walnut chocolate chip cookie sounds delicious! Thanks for hosting! i'd love to try the collosel trail mix cookie! i follow you on twitter and tweeted the blog. I would LOVE to try the TRAIL MIX cookie! looks so good! I like the Protein Bakery on facebook! Im a GFC follower and I would like to try the Black and White Blondies. The Pumpkin Walnut Chocolate Chip Cookies & Blondies look really good. i follow on gfc. GFC follower: Atreau.I would love to try the Espresso Brownie with Cappuccino Chips. GFC – ChosentoBeFreeI'd love to try the Blondies! I follow you on on Google Friend Connect under the username lilyk. I tweeted about this giveaway on Twitter at https://twitter.com/#!/likwan/status/143012329448157184.